2130.01.01 The Galaxy is at war. After studying the flurry of war declarations, it looks like the Gizurean Consciouness and Paratakis Collective have both annoyed a lot of empires, and drew their wrath. Olympia hopes it will remain unnoticed in the mess. 2130.02.08 Most of the ships are completed, except for some destroyers, but they will arrive as reinforcements. It is time. 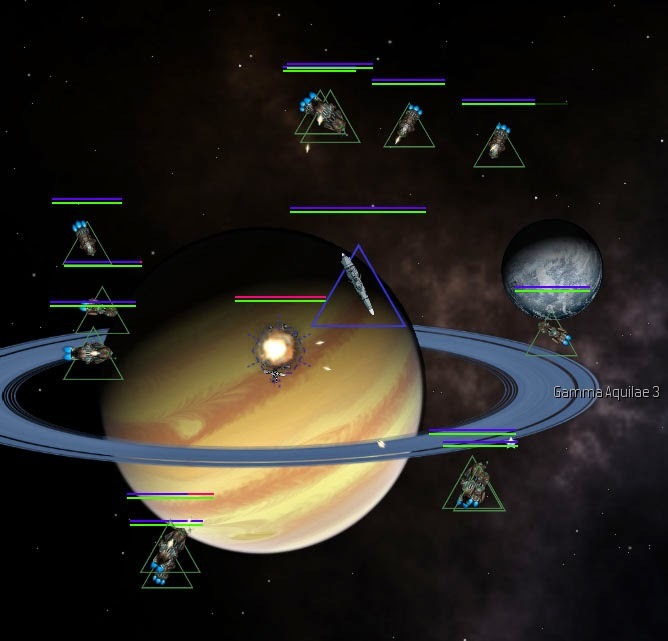 3rd Fleet sets a course for Elysion. 2130.03.01 Troops have been loaded at Olympia and are sent to follow 3rd Fleet. Agent Tarfan is dispatched to incite a rebellion at Elysion. 2130.04.03 The rebellion is underway. 2130.06.06 3rd Fleet closes in on the target, 5th Fleet, filled with assault troops, is close behind. The Olympian Ambassador to the Great Atuuko Supremacy looks at his watch and prepares to deliver the Declaration of War. 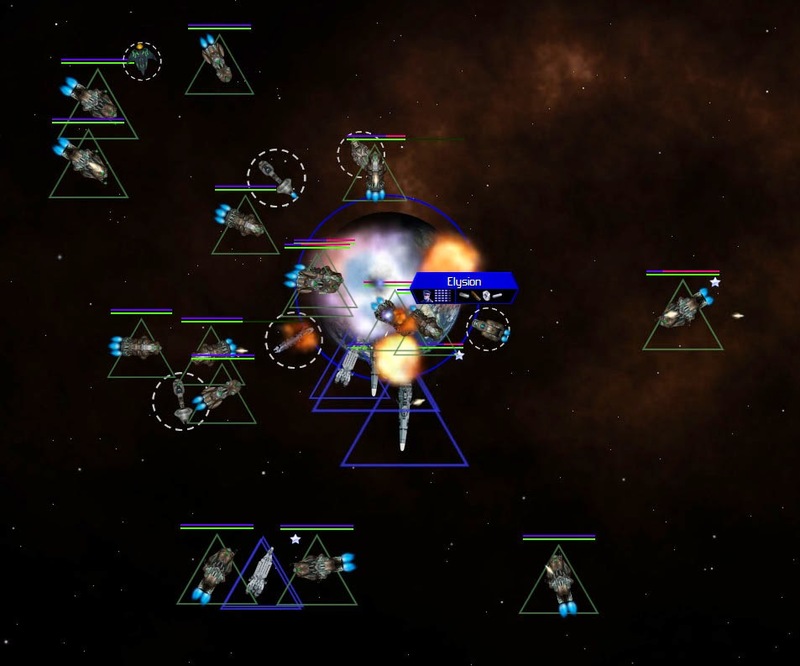 2130.06.07 The first ship in 3rd Fleet, Potent Chaos, exits hyperspace to find the Elysion system bare of a defense fleet, and only one defensive base, still under construction. War is declared. The Atuuko appear to take it in stride. 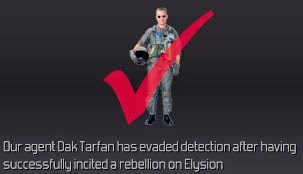 The rebellion on Elysion appears to have been quelled, and Agent Tarfan is immediately sent back to incite them again. 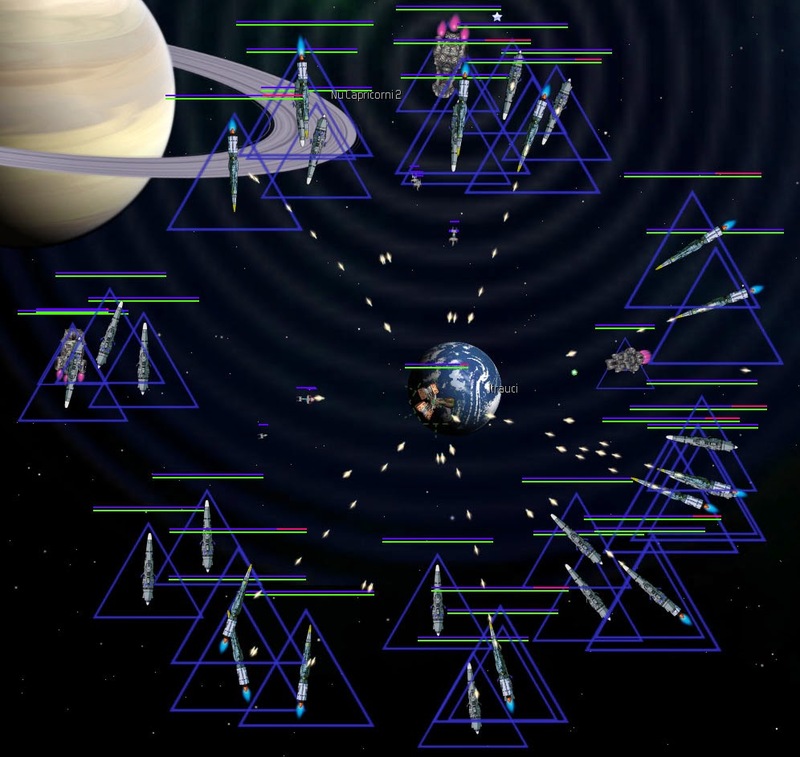 In the midst of this, the Kiadian Federation makes peace with the Paratakis Collective and so does Olympia. Good to be out of that mess. 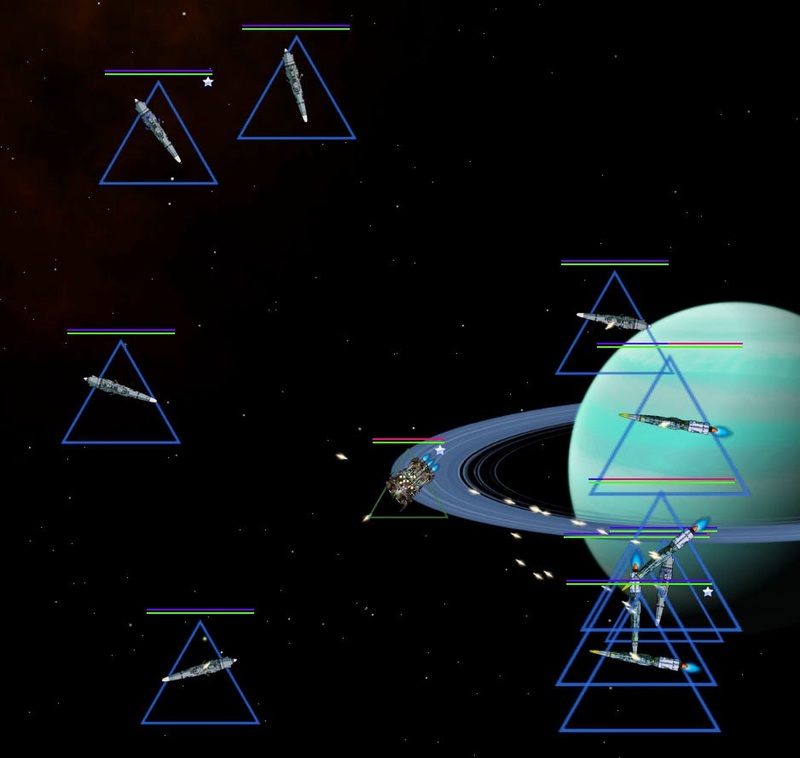 The Fleet takes out the Defensive Base, and awaits the troops. The troops land, and the rebellion begins. 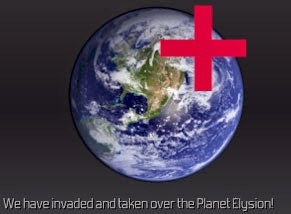 It looks like Elysion will be liberated! 3rd Fleet awaits the Atuuko response. 2130.10.01 Elysion has been liberated! 2130.10.02 The Atuuko response begins. 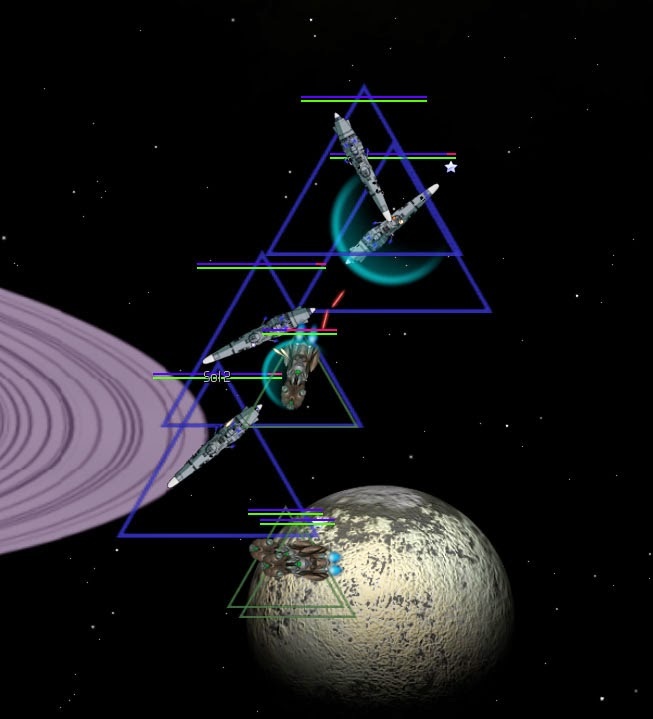 A frigate arrives in the system. It should not last long. The fleet takes out the frigate easily, and the balance of 3rd Fleet arrives. 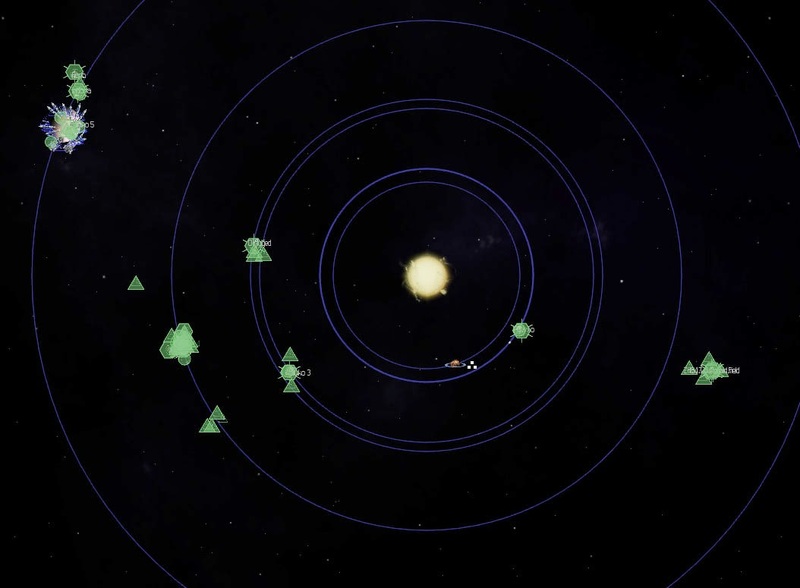 Atuuko 6th Strike Force, consisting of four frigates, is on a course towards a mining station near to Olympia. 4th Fleet, the Olympia defense fleet, is ordered to intercept. 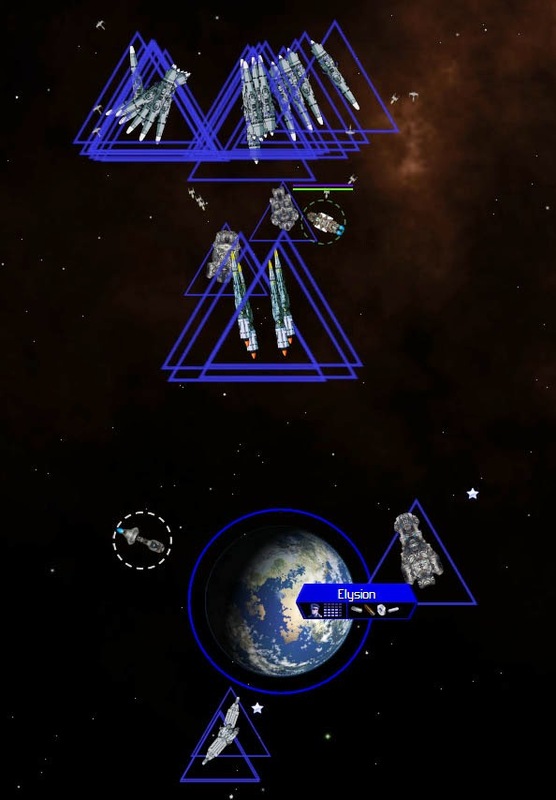 Atuuko 11th Strike Force, 4 ships, is crawling back to their home territory, all four ships out of fuel. Attuko 9th Fleet contains 16 ships, 558 firepower, all very low on fuel, returning to base to refuel. Atuuko 12th Strike Force contains four ships, 260 firepower, retrofitting. 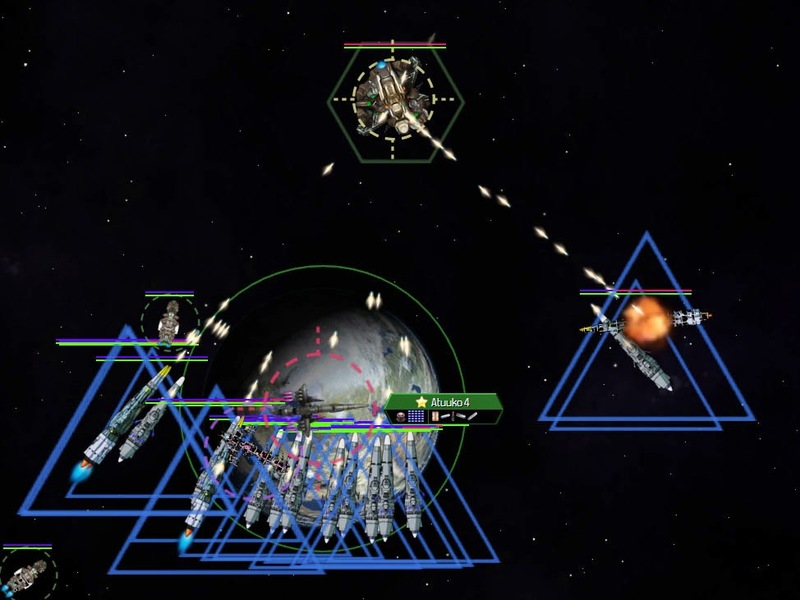 Atuuko 13th Strike Force contains four ships, 220 firepower, retrofitting. The Olympian 3rd Fleet has 2,892 firepower. Time to tear the Atuuko apart, but leave their home planet alone...for now. The economy is very much in the red, with -43k, and -64k cash flow. Olympia sells the Teekan Corporation Rail Gun technology to stem the bleeding. 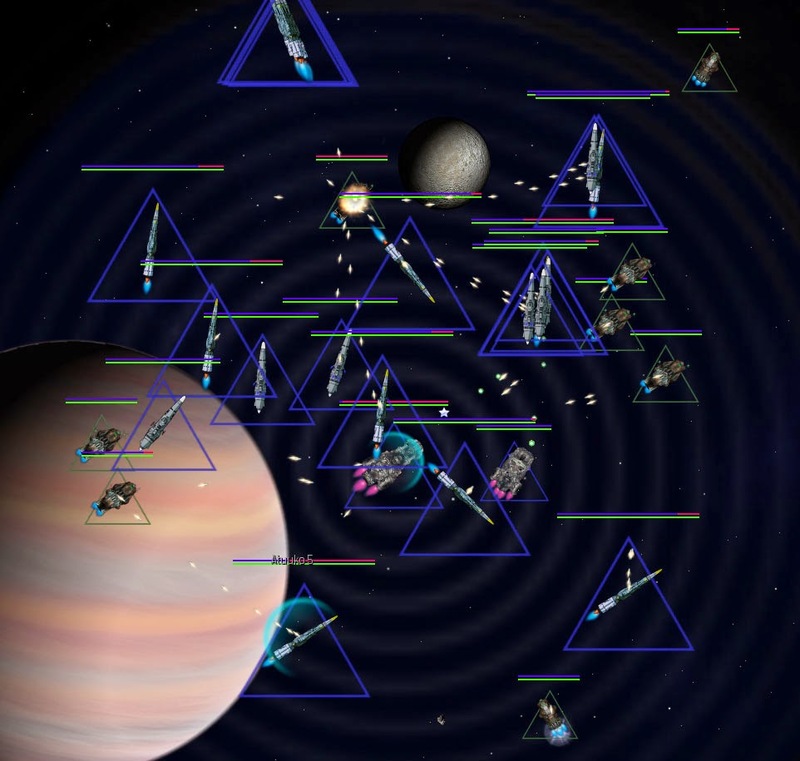 Elysion uses the cash to build a Large Space Port for defense. 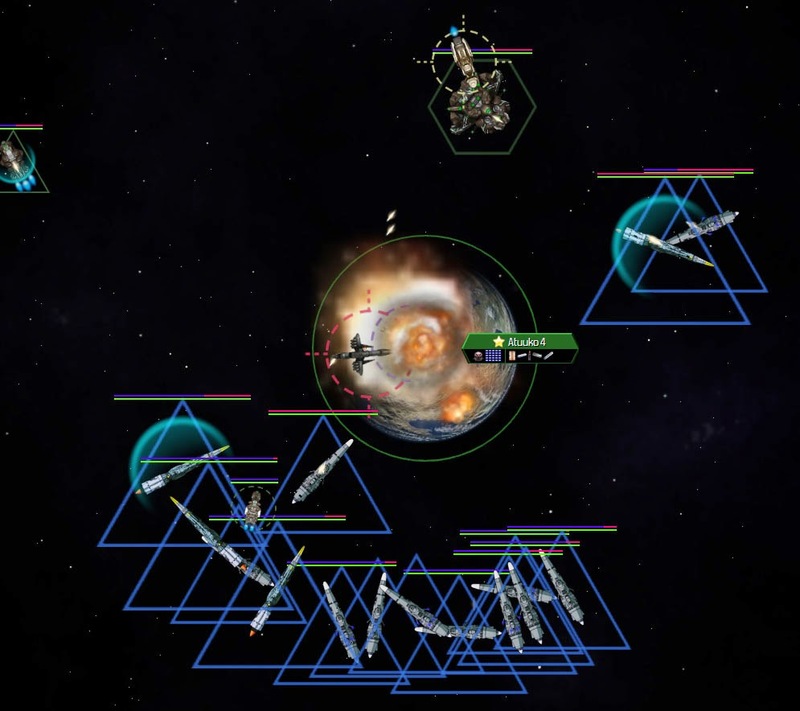 6th Strike Force arrives at Stedenoa, succeeds in destroying the mining station, but 4th Fleet is waiting for them. One enemy frigate dies right away. A second receives some hull damage and escapes. The two that remain make a run at Sol 2 Gas Mining Station. 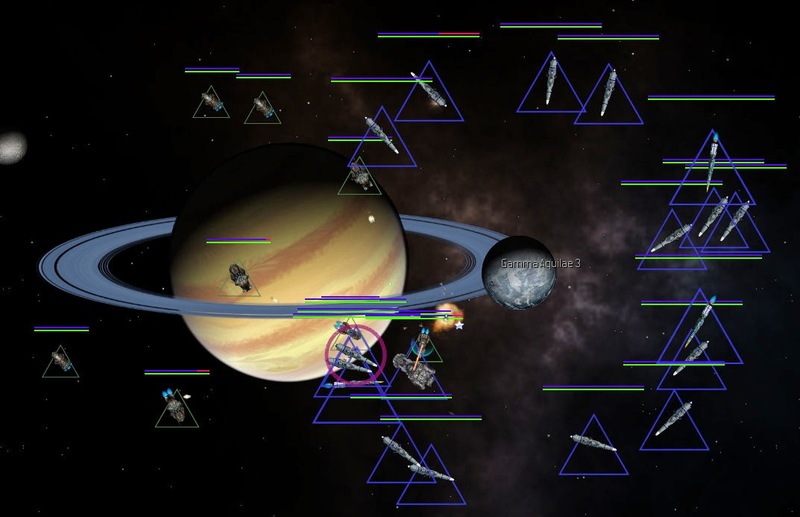 2131.02.29 They destroy the Mining station, one enemy frigate escapes, and the other heads to Elysion. 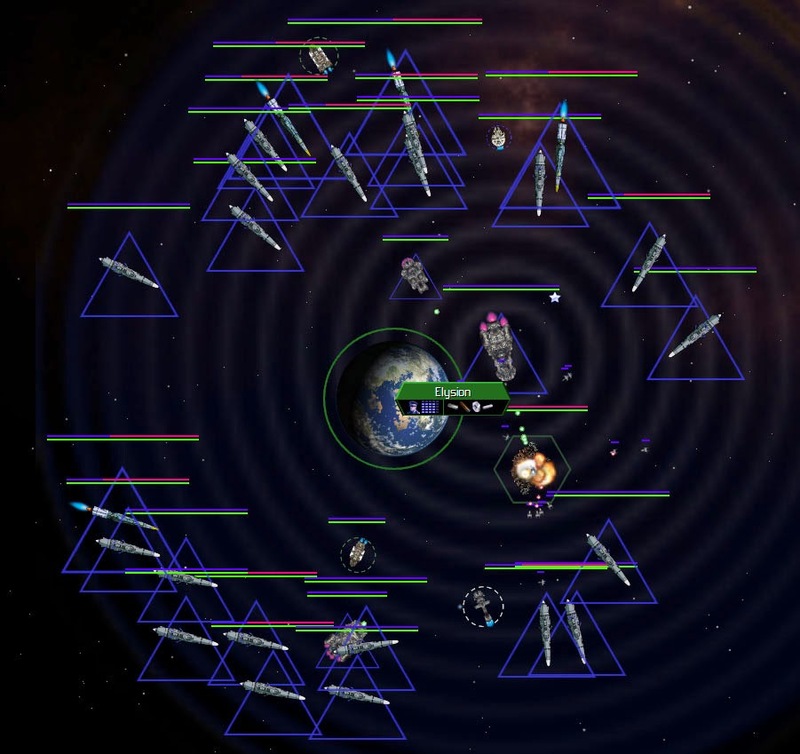 Two ships are detached from 3rd Fleet to return and protect Elysion. 2131.04.27 3rd Fleet closes in on its target. 2131.05.04 3rd Fleet arrives and the battle begins. It is a massacre. A few Atuuko ships escape, but the rest are overwhelmed. 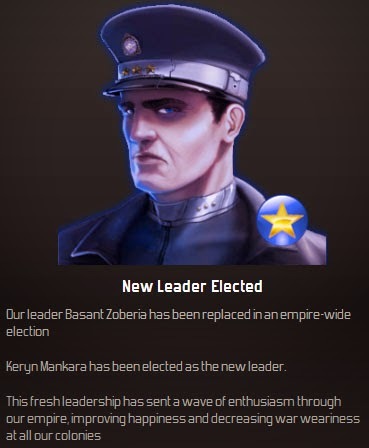 In the wake of the victory, President Zoberia is replaced by President Keryn Mankara. Itrauci Mining Station does not stand much of a chance. Some of the ships in 3rd Fleet are low on fuel, but the Navy wants to keep the pressure on. An attack on the Atuuko system is authorized, but not Atuuko 4 itself. 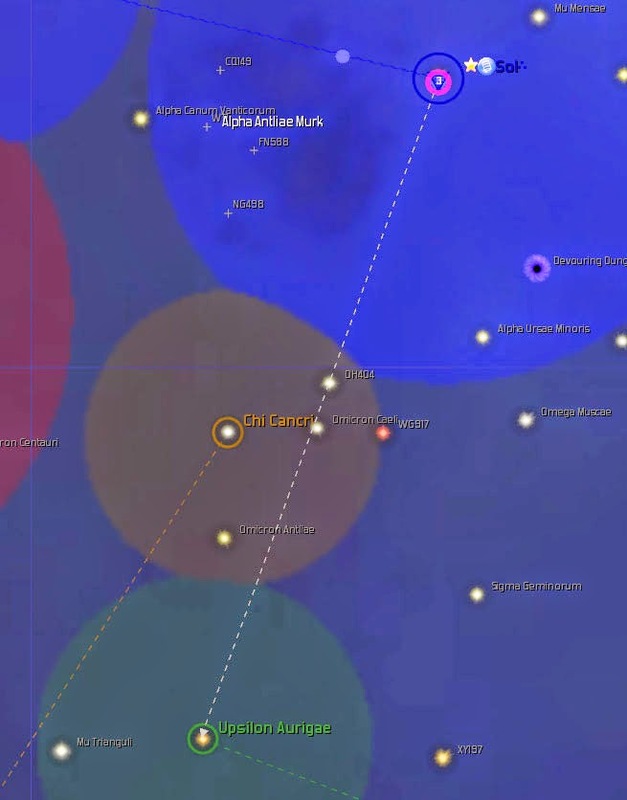 2131.08.01 3rd Fleet arrives in the Atuuko System, attacking a mining base and hoping to stir up some action. 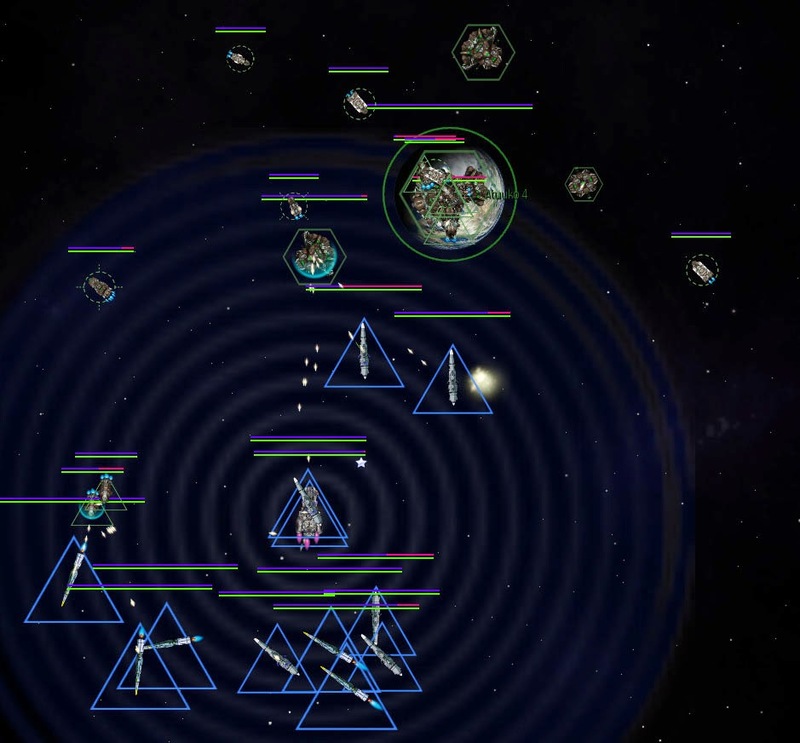 The destroyers in the fleet have reached the limit of their range, so they will have to limp home, but they have enough fuel to fight for a while. The Atuuko defense fleet arrives. Something is drastically wrong...while the recovered ships in the fleet are battling away, all the Olympian-built ships, while they have fuel, are simply not firing their weapons. A quick glance shows that none of them have any energy!! Desperately low on fuel, 3rd Fleet is forced to withdraw. Money is still low, so Olympia sells Entertainment Systems to the Ikkuro Confederacy, and gets back in the black...for the moment. While 3rd Fleet limps back home, the Atuuko seem content to pick up the pieces. Olympia spends the time upgrading bases and ships [to fix that horrid energy problem--in retrospect this helped but not all the way...], and replacing damaged and destroyed bases. The economy needs to stand on its own, and soon. Originally the intention was to rip the Atuuko to shreds, but now Olympia is content that they have been taught a lesson, and will welcome peace. Elysion is liberated, and that is what matters. The Zenox reveal more information. EX-04, recently retrofitted, is sent to the Xi Tucanae system, to hold position...for now. 2133.01.01 Multiple attempts are made to end the war with the Atuukos, but they do not want to agree. So be it. 3rd Fleet will refuel/retrofit, and go at it again. War weariness is critical, but the colonies are still hanging in there, so the war continues. 2133.04.26 Crap. 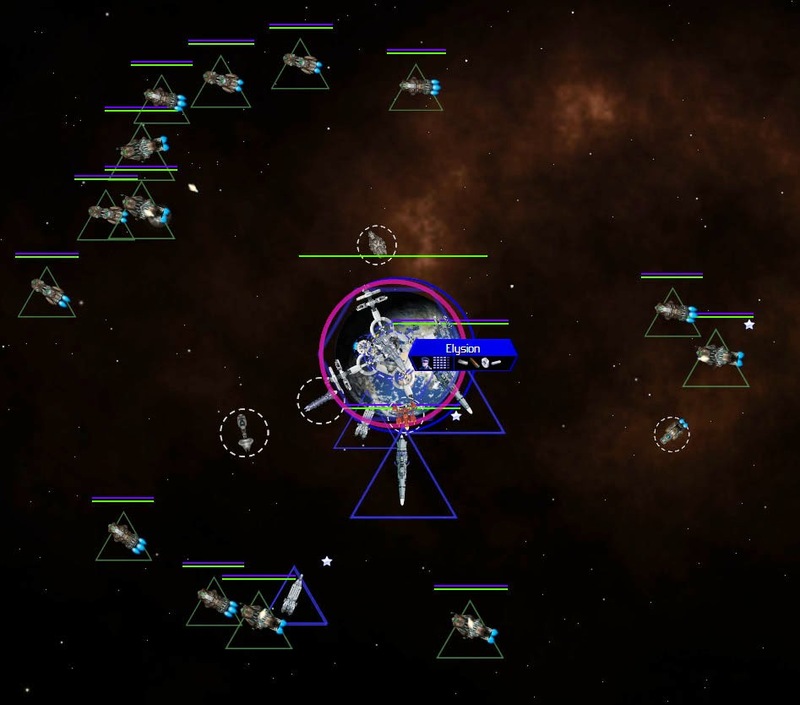 As 3rd Fleet nears completion, the Atuuko attack Elysion, before the space port is fully operational. Crap. Crap. Crap. Elysion quickly falls to the overwhelming attack. 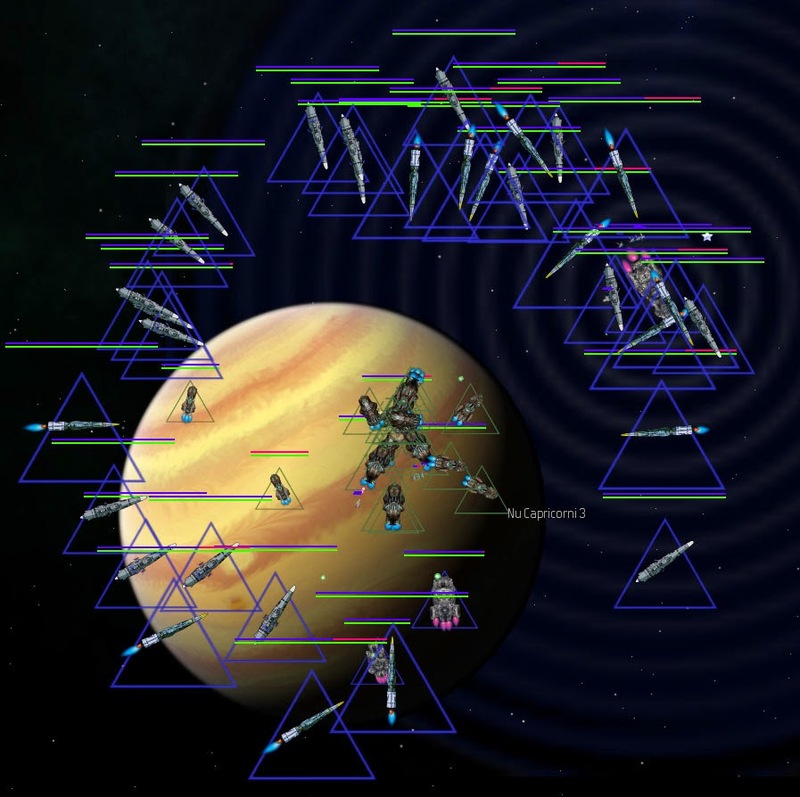 Several completed ships at Olympia from 3rd Fleet, led by Bitter Cutlass, are detached as 8th Fleet and sent to Elysion...too late. Worse, they arrive piecemeal and Bitter Cutlass and the frigate Phoenix are damaged by the Atuuko 12th Fleet. They rendezvous, and then proceed to Elysion after Atuuko 12th Fleet leaves. The Atuuko 12th Fleet proceeds to the Gamma Aurigae gas mining station. The balance of 3rd Fleet also heads in that direction, and the two fleets should arrive roughly at the same time, with the Atuuko 12th Fleet probably arriving first. 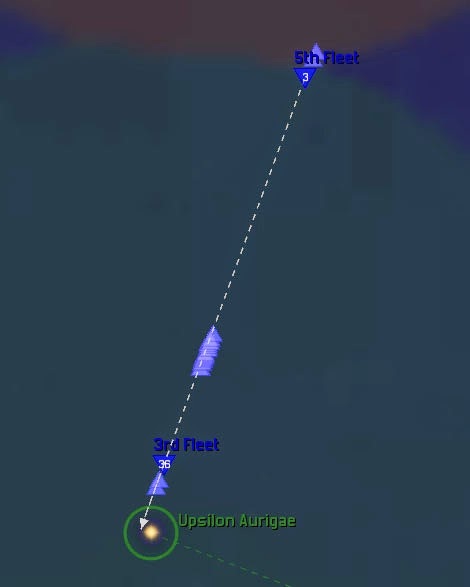 2133.10.12 As predicted, Atuuko 12th Fleet arrive first. One ship from 3rd Fleet, the frigate Monoceros, moves to escape. Devastator arrives first, wasting a frigate immediately, and buying time for the rest of the fleet to arrive. The first batch of 3rd Fleet arrives. 3rd Fleet destroys most of the Atuuko 12th Fleet, although a few ships get away. 2134.01.01 Also worrisome is that the Naxxilians, with whom Olympia had a Free Trade Agreement, recently initiated Trade Sanctions. Apparently they covet the Olympian colonies. If they declare war on Olympia...that would be very, very, bad. With the new year, some major actions are taken. Olympia sells lots of technology to other races to raise cash, but of course, no weapons. Then all of the ambassadors are sent to the nearby “trouble” empires. 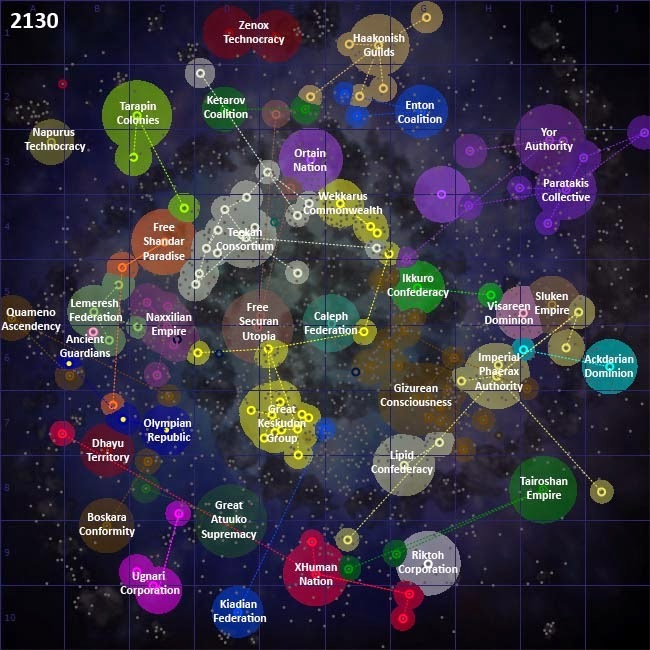 All spaceports are upgraded to include medical centers and recreation centers, and their build order is changed. 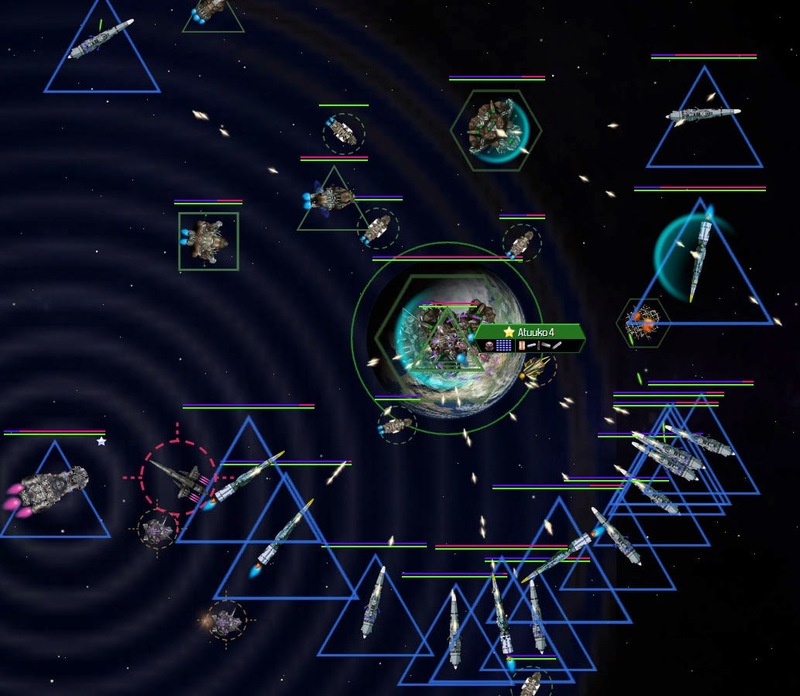 2134.03.25 3rd Fleet arrives in the Eta Telescopii system, ready to raise some hell. The fight goes more or less as expected. 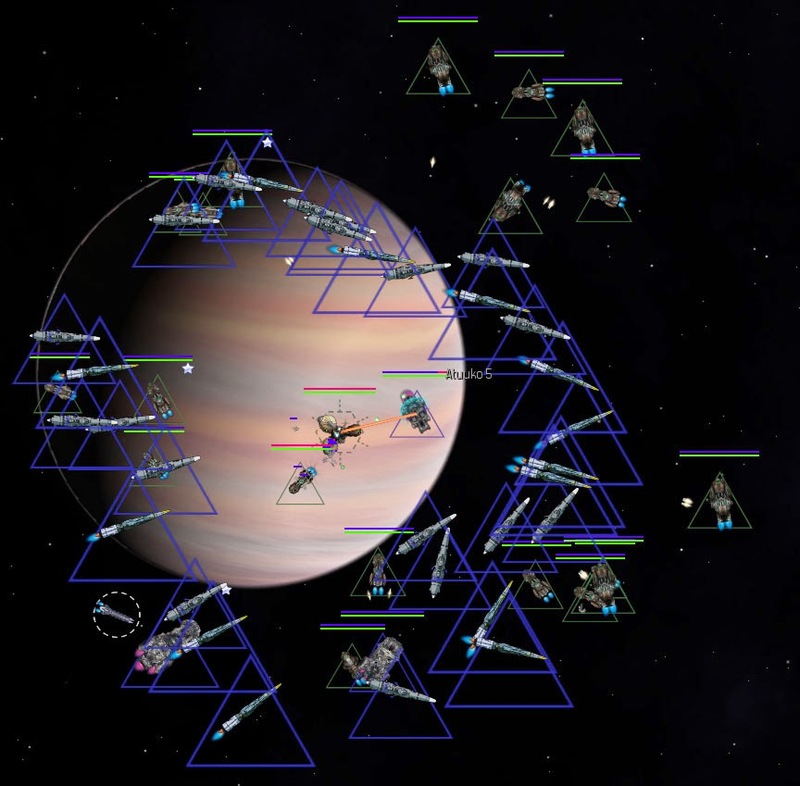 2134.07.14 3rd Fleet arrives in the Atuuko system and wreaks havoc. Devastator is at lower right wasting some frigates while the rest of the fleet is at upper left. 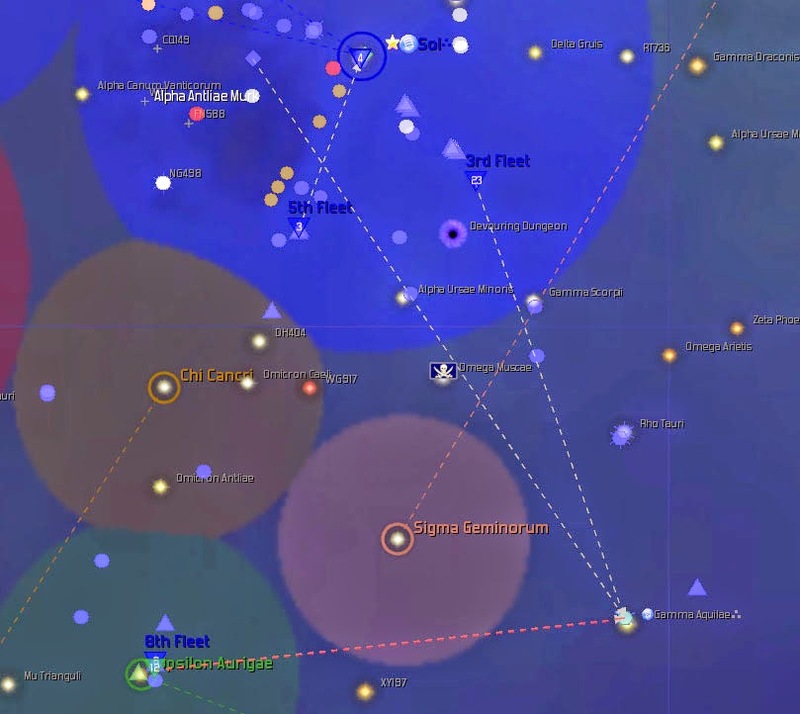 2134.08.20 While 3rd Fleet lays waste to the Atuuko system, the Atuuko have sent their 14th Fleet to attack the Upsilon Vulpeculae system (Reunion’s system). 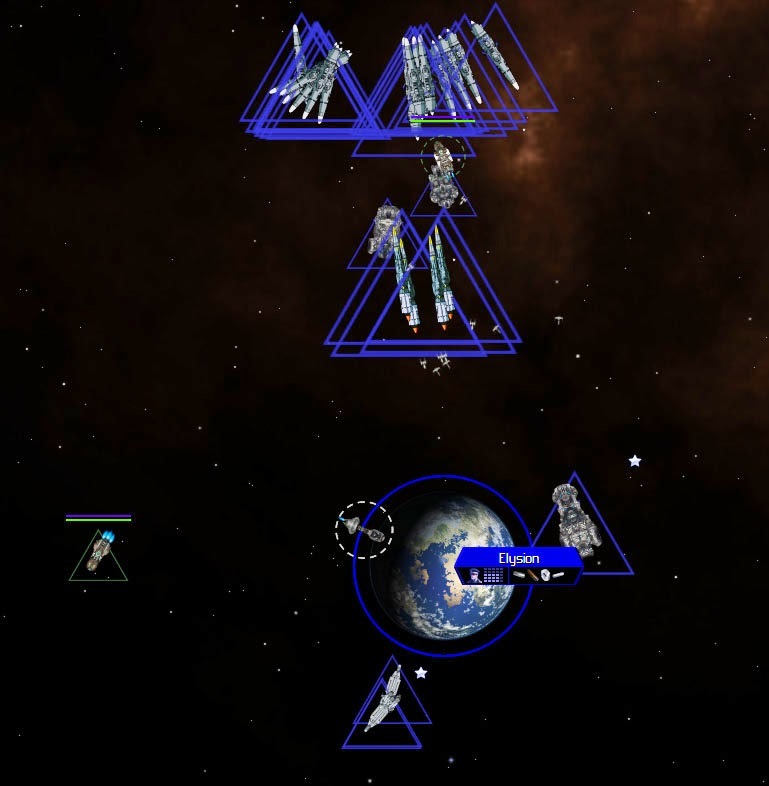 This fleet contains three ships, a destroyer and two advanced cruisers. 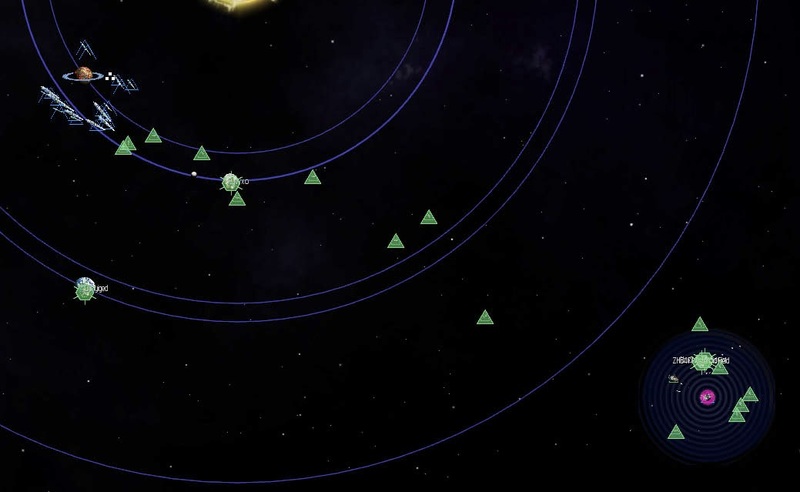 Fortunately, the defensive fleets are enough to fend them off. The Atuuko attacks are becoming desperate. 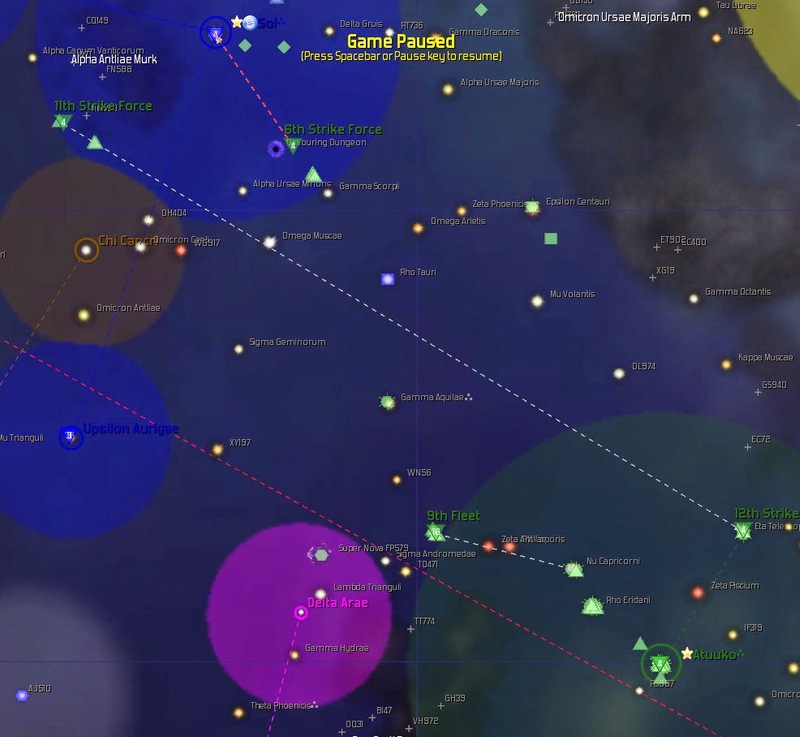 The attack on Reunion fails, and another fleet tries to take out the Elysion blockade fleet, but fails, and their attempts to defend the Atuuko system is in big trouble. In the Battle of Atuuko (2), 3rd Fleet loses its first ship, the destroyer Melpomene. 3rd Fleet focuses down one defense battery. 2134.11.11 It is election day, and as the attack continues, Dak Undulian is elected President. The battle continues, and soon it may be time for 3rd Fleet to withdraw. They are low on fuel, and the Atuuko Space Port is a tough nut to crack. 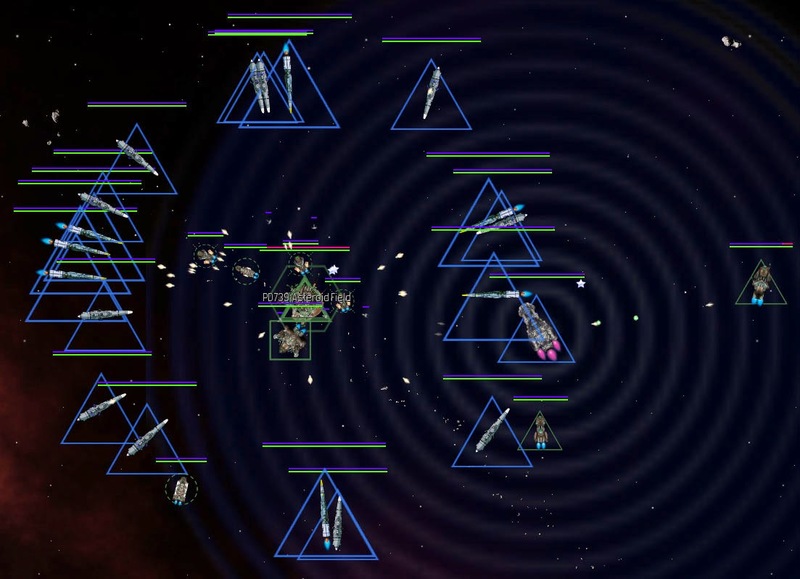 The Fleet moves to standoff range and pounds the Space Port with Concussion Missiles. 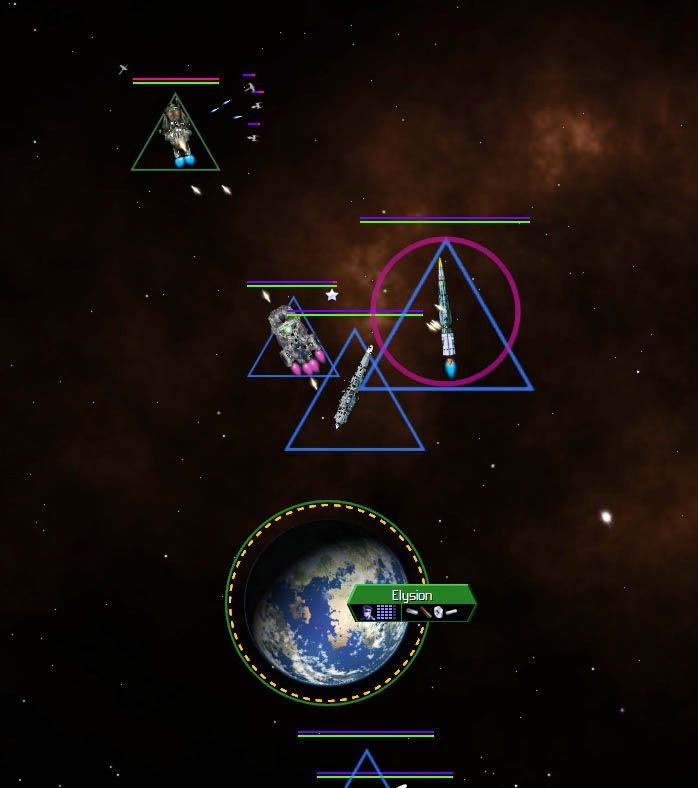 The Space Port goes down. Mission Accomplished. 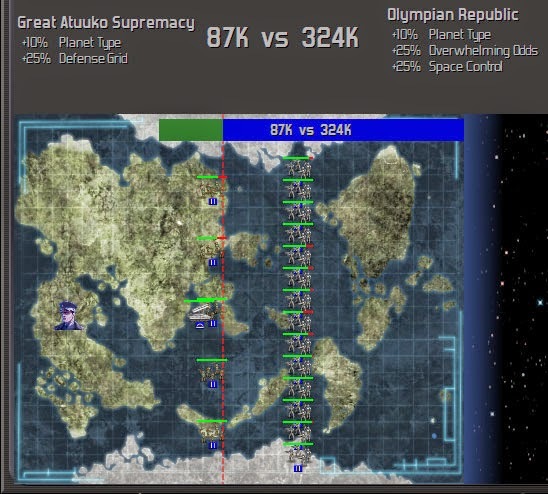 The Atuuko Supremacy isn't so "Great" anymore now that their homeworld doesn't have a spaceport. It does have an Orbital Defense Battery, though, so the fleet takes it out but loses Irene in the process. After destroying the battery, the fleet retires.